Ron Taylor has been working with the water-borne Eico Alterior Gloss, a very low VOC 100% acrylic paint from Iceland. Eicó, with an accent on the “o”, do produce a fairly wide product range, what is this gloss like? The 2.5 litre product comes in a sturdy and useful tin, which serves as a nice kettle when empty. Looking at all their products on the internet, I must admit my heart sunk a little to see that the packaging of the cans is almost identical throughout the range (as with F&B, LG, Mylands). I don’t like this arrangement. When you are working, it is all too easy to mix up different finishes of the same colour. Tin livery aside though, there is little else to dislike about this product. The paint is fairly thick in the can, and Eicó state the product can be thinned up to 10% with water for certain applications. Normally I don’t thin any trim paint with water, unless I’m HVLP spraying ie I would normally add Floetrol or XIM X-Tender to condition the paint. However, when I did try this product with conditioner only, I didn’t get the result I was expecting. It’s worth experimenting with this type of thing, as it will pay dividends in the future when you hit the sweet spot. I am pleased to reveal that Eicó Alterior gloss performs very well when thinned with both water and conditioner. I used a couple of brushes in the Alterior Gloss, a Corona Ryan and a Purdy XL Dale. 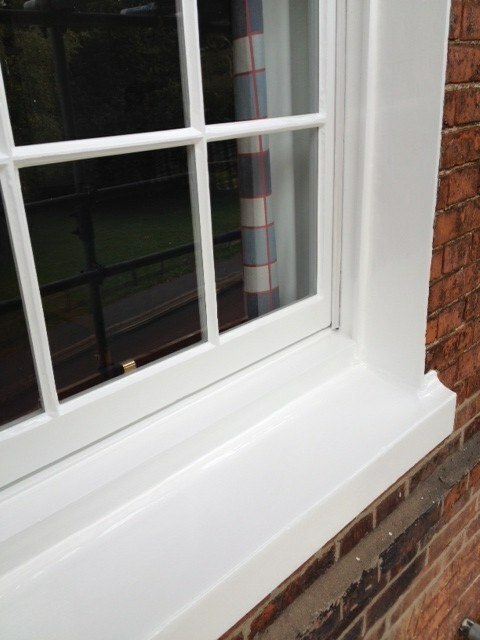 These are thin angled sash brushes that suited the window painting job in hand. The Corona applied the paint quickly and fairly smoothly but I found the Purdy gave just the finer finish, though application went a little slower. I’m guessing that Corona’s Tynex/Orel range would be equally at home with this product. I used the gloss over both Johnstone’s Trade Ultra (water-based) and Zinsser Cover Stain (oil based primer), with very good results. The paint applies evenly and spreads well. It has one of the best open times I’ve experienced with a pure acrylic paint. The XIM would have helped, but I think the product is formulated very well with this in mind. I used the white and opacity was very good. Some white acrylic paints can struggle over Zinsser Cover Stain but not the Eicó. It’s still a 2 topcoat system, but 2 coats of this over a white primer will see the job done. Will report back about coverage when overcoating darker colours. Is this the high gloss water-borne paint we are after? The shine increases when the second coat is applied. The finish is glossy, but I wouldn’t put it in the high gloss category. I would say though, that this is a very acceptable sheen for an acrylic gloss. The flow out of brushmarks, though not complete, would put this product high up the list for water based trim finishes. You will also notice that the brushmarks do tend to receed even after the initial tack-up of the paint. The Eico’s low VOC formulation is going to draw comparisons with Mythic’s range of zero VOC products. 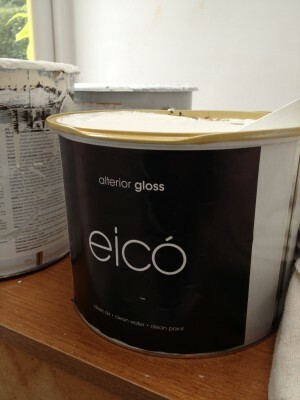 I’ve now used both and would definitely give the Eicó Gloss the edge over the Mythic Gloss for finish and application. 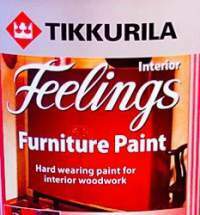 I can’t speak for the lower sheen paints in the range. 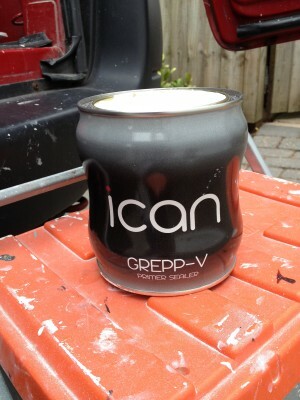 I haven’t yet used the Eicó over the Grepp-V primer, but I have had a chance to briefly use the primer. This is a hybrid product that is claimed to be adhesion promoting and a stain blocker. This far, I can’t vouch for either claim, but the product does apply very nicely and opacity is very good. Being a hybrid you do have more time to work with the product before it tacks off. Beware of over application though, as it does like to run, if applied to thickly. It dries to a very flat white when dry. Thanks to Ben Sturges at Paints and Interiors in E Anglia for pointing me in the Eicó direction and giving me the benefit of his considerable experience. As with all products we write about on Traditional Painter, I can’t highly recommend this paint on the back of just a couple of jobs, but so far, very good. Eicó does have a good pedigree, from personal experience it does seem to have usability advantages over the Mythic pure acrylic gloss paint, albeit not as glossy, and I will be using more of their products in the future. Ron will report back to update his findings so far, as there is nothing like time to iron out / reveal problems / confirm we have a star. 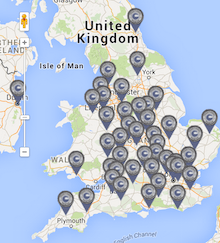 If you have used Eicó products extensively, we would welcome your feedback. We are all here to learn. Behind the scenes, Traditional Painters have been on the search for nirvana – the number 10 Downing Street high gloss finish in a non-yellowing, non-brush-wrecking, white water-borne paint! Aim high, say I. We will keep you posted. Ron Taylor, a specialist painter and decorator based in Kenilworth, is the Traditional Painter responsible for hand painted kitchens throughout Warwickshire. Ron is one of the UK’s leading authorities on the specification and application of water based and waterborne paints. How long should I leave between the 1st and 2nd coat of the gloss paint and will the second coat lessen the brushmarks? Whats the Eico paint like in comparison to little greene on walls and ceilings etc now you have had a bit of time? All the information I have collected about using Eico wall paints is to be found on this TP forum search for “eico”. It is mainly our forum members’ experience and input. TP specialists haven’t got enough info to do the brand comparison you are asking about. However Ben at Ray Munn Paints is well placed to give you a fair appraisal.